Today the Gorsedd honours for the 2015 Eisteddfod were announced and we are delighted to report that Hafal Chair Elin Jones will be among those honoured at a special ceremony on the Eisteddfod Maes in Meifod on Friday 7 August! These honours, presented annually, are an opportunity to recognise individuals from all parts of the country for their achievements and their commitment to Wales, the Welsh language and to their local communities across the whole of Wales. “Elin Jones, Ystrad Mynach, is a lively and keen historian, scholar and teacher who has furthered our understanding of the identity of south east Wales. She has written and broadcasted extensively on topics such as the history of the Chartists and the development of the Welsh coal and steel industry, in her own energetic and intelligent style. 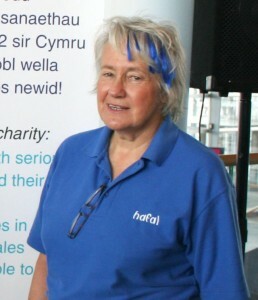 Congratulations Elin on a thoroughly deserved honour, and a huge thank you on behalf of Hafal ‘s Members for giving voice to the concerns of people with a mental illness and their carers in Wales – in both Welsh and English!